The triangular, white corpse-hat consists of a small strip of cloth, cut or folded into a triangle, which covers the forehead and wraps around the back of the head. It works like a headband, and the Japanese use the word boshi (hat) or nuno (cloth) when describing it. The cloth is not a consistent item on the costume of a yurei, a Japanese ghost. As with everything else in life, burial fads come and go. Although the white burial kimono, called a kyōkatabira, has stayed the same for centuries, the same thing cannot be said about the cloth. 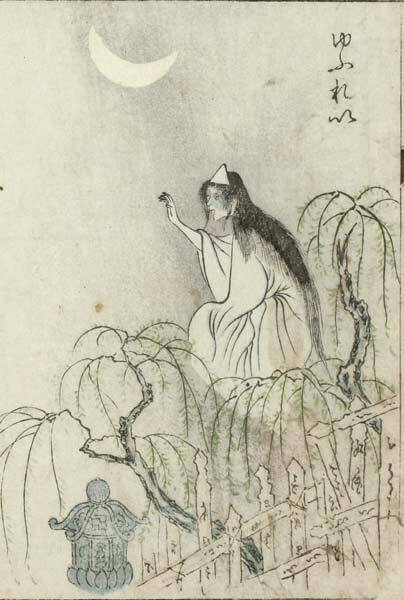 The cloth appeared around the Heian period and yurei-e (ghost pictures) from this era often show yurei wearing the cloth. It is possible the corpse-hat was based on the Heian period eboshi hat that was popular at the time. Whatever its origins, the custom seems to have vanished by the Edo period. 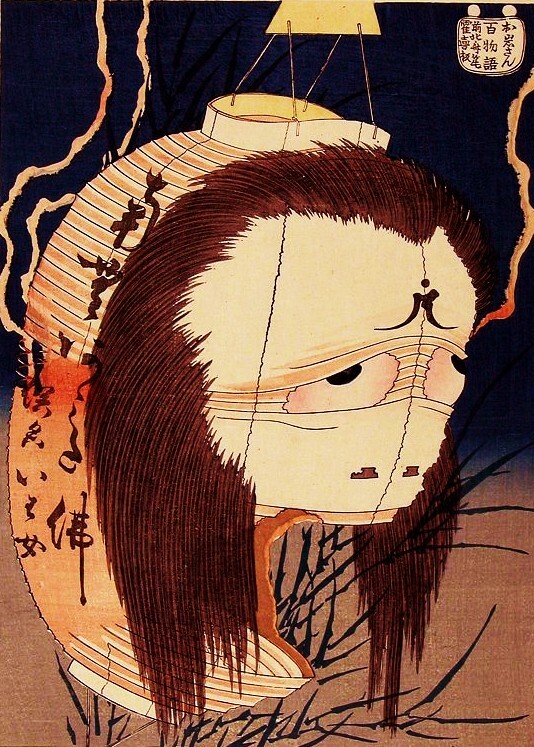 It is worth noting that in Maruyama Ōkyo’s famous painting “The Ghost of Oyuki,” considered an accurate portrait of a yurei, Oyuki does not wear the cloth. In modern times, the cloth has become particularly associated with the sea ghosts called funa yurei, who always wear it. I keep calling it “the cloth” because there is no specific word for it. The cloth goes by multiple names. The most grandiose term is tenkan, meaning heaven’s crown. The most commonplace is zukin, which is a standard word for hood or kerchief. Several of terms are simple and descriptive, like hitaieboshi meaning forehead hat, or hitaikakushi meaning forehead-hider and kamikakushi meaning hair-hider. The most basic term of all is sankaku no shiroi nuno. This means triangle-shaped white cloth. The meaning of the cloth is speculative, although there are two main theories why it came into fashion. One says that the dead have ascended to a higher level, and thus the tenkan (heaven’s crown) is placed upon their heads to show their new status. Another says that the sharp point of the triangle wards off evil spirits or demons from entering the now-empty body from the head and resurrecting the corpse or preventing the spirit’s transition. In all likelihood, there is some truth in both of these explanations. 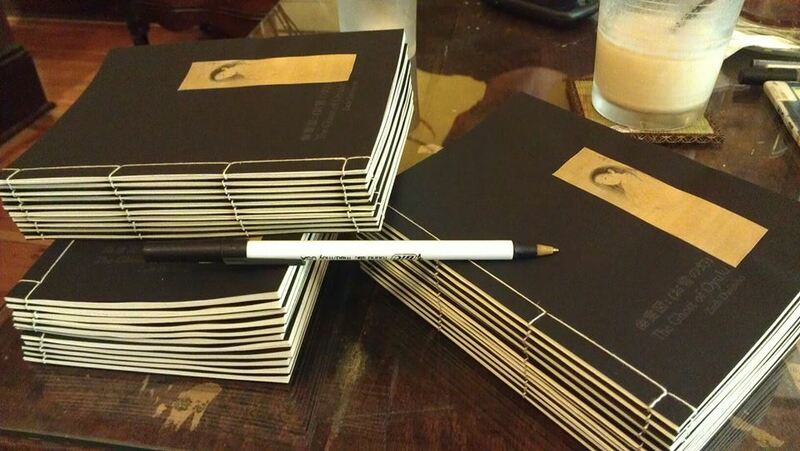 For more about the origins of Japanese Ghosts, you can purchase Zack Davisson’s limited edition yomihon chapbook The Ghost of Oyuki from Chin Music Press. Why do Japanese Ghosts Not Have Feet? The kanji is 天冠, which can be read as either tenkan or tengan. The word isn’t specific to the yurei triangle cloth, and also refers to the halos around Buddhist figures. The tenkan/tankan mix-up is just a typo on my part! Sorry about that, and thanks for bringing it to my notice! Interesting that “hair-hider” and “kidnapped/taken by spirits” should have the same pronunciation- kamikakushi. I’ve noticed that puns are very popular in Japan, could this be an example?